If you think this belongs to you please ring Anita (see below for details). "I thought you might be interested in what was going on at 55. I've uploaded out track for the event and overlaid it on the map and it shows that both the base map and the actual location of the control as set were incorrect. Martin & I were heading west from 54, 56 etc, following the taped track till it hit the road. We then proceeded up the creek to the north from the log bridge in search of the creek junction. 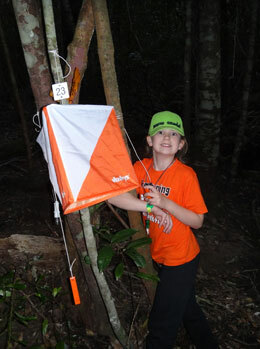 We gave up after a while (too far) and fortunately encountered another team that pointed us in the right direction. 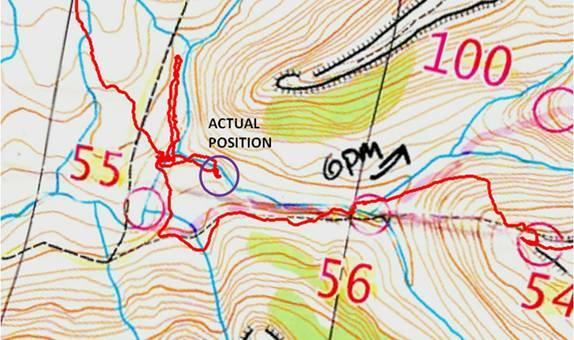 Whilst the creeks may be in the right position, the major track north as marked is incorrect, and the flag was also placed in the wrong location. The actual creek junction does not appear on the map." 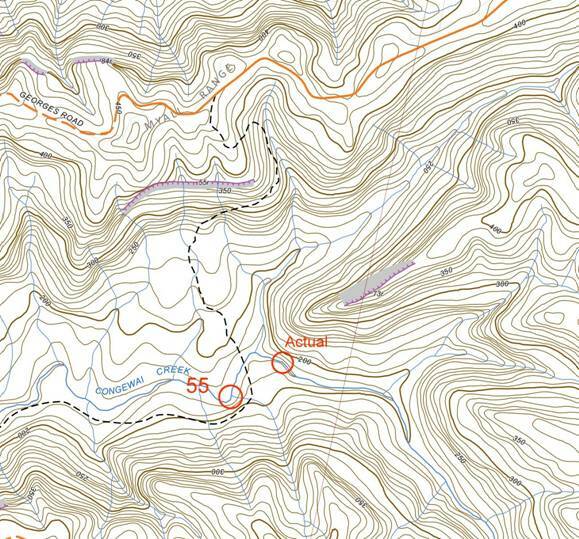 "The Rogaine map seems to agree with the current published topo map from Lands. I also downloaded the most up to date vector data that's available from LPI (using the 'nswtopo' application by Matthew Hollingworth from ACTRA) and whilst the creeks are the same, the track location has been updated." The course setters and vetters always do the best they can to get it right every time, but unfortunately this error slipped through uncorrected. This year's Lake Macquarie Rogaine will incorporate the NSW Championships. The option of a 6 or 12 hour event, both starting at midday. (To compete in the NSW Championships you must enter the 12 hour event). Family Loops around the Hash House. Longer technical routes incorporating a Tea and Damper stop, and. A longer loop (40km+) featuring a training run for mountain marathon runners. 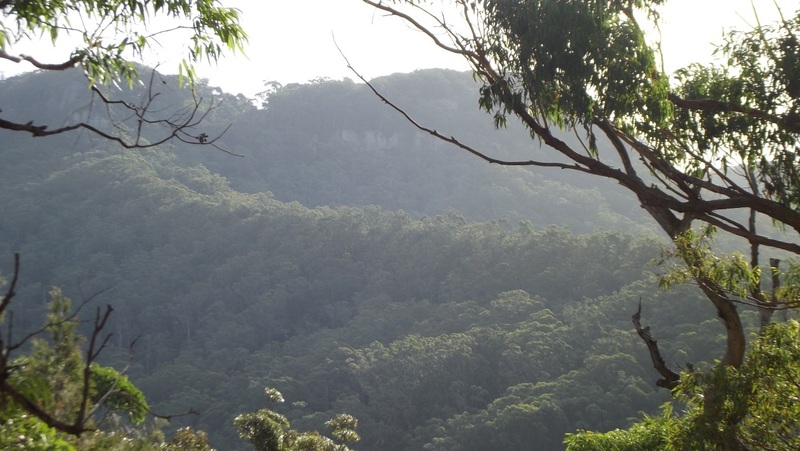 It will take in the Heaton State Forest and Watagan National Park. Once again the event is supported by Lake Macquarie City Council as part of the Lake Macquarie Games. The Watagan Mountains are west of Australia’s largest coastal salt water lake. The event will be held near Heaton lookout with scenic views of Lake Macquarie, only two hours north of Sydney. The area to be used will mostly be in the Watagan National Park with beautiful rainforest, pristine creeks, friendly fauna and an extensive track network to allow competitors the option of avoiding some of the navigation through dense vegetation. This popular event is an opportunity for novice competitors to gain experience in rogaining or night navigation while also providing a challenge for the more experienced rogainers. As always navigational skills will be required and Bushwalkers' Wilderness Rescue will be doing safety with the guys at Cooranbong SES. This event offers a "Concession" rate. It includes ..